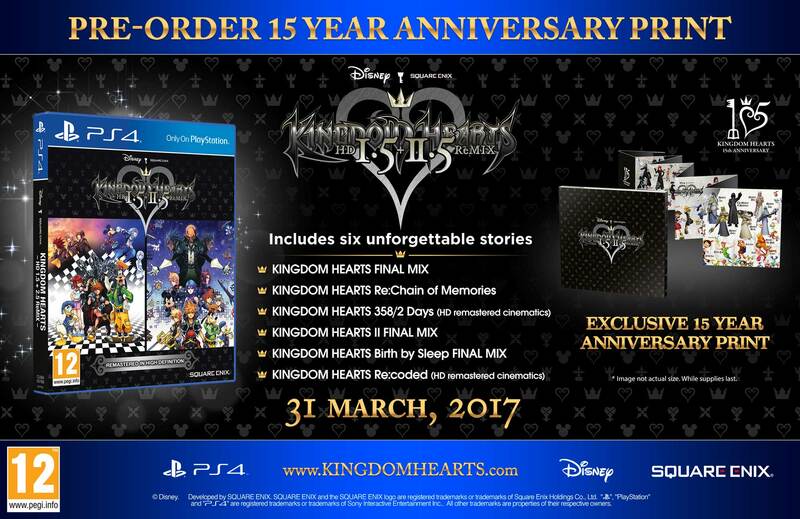 The long-awaited PS4 remaster, KINGDOM HEARTS HD 1.5+2.5 ReMix, will be releasing in just about 2 weeks and by now, many fans have already placed their preorders at the retailer of their choice. However, if you have still yet to do so and reside in the UK, you're in luck! GAME is offering an exclusive 15th anniversary print with preorders of the game, featuring renders of characters from throughout the series as shown on the mural displayed at the stained glass memorial exhibition in Shinjuku back in January. Not the worst thing to get as a pre-order bonus honestly. Well, well, well, this is the first time in a long time that I'll shop at Game again. They have a bad habit of over-pricing their games. This is cool I guess, but it's nothing compared to YET ANOTHER pin for the North American Audience! Take that, rest of the world!!! Given the public's perception on KH3, I am assuming they are going to go all out for that game. At least I hope. I'd vouch to disagree. Disney is more actively involved with Kingdom Hearts III as opposed to the remasters and remixes. Meeeeh.. I would have bought it had it been a print of the murals though. Not worth it IMO.